The ruling APC says senators should reject Senate President Bukola Saraki just like delegates of the PDP did at the weekend. At the PDP convention to pick a presidential candidate, Saraki came third with 317 votes. The APC described it has disappointing performance. The national assembly will resume on Tuesday after more than seven weeks of recess. During the recess, the APC repeatedly called on Saraki and Yakubu Dogara, speaker of the house of representatives, to vacate their offices. In a statement, Yekini Nabena, acting spokesman of the APC, said Saraki’s “disappointing” performance at the convention is an end “to the ambition of a greedy, untrustworthy and double-dealing politician”. Nabena said as senate president, Saraki has always been at loggerheads with the executive. “The delegates of the PDP have rejected Saraki as their presidential candidate. Let the Senators also do likewise by rejecting the greedy, deceitful and unreliable Senate President as their leader. A new President of the Senate, free from all allegations of criminality is needed now,” the statement read. 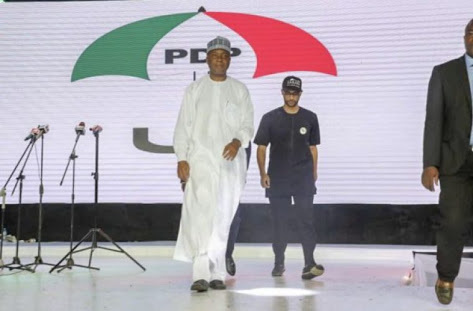 “The disappointing performance of Sen. Bukola Saraki at the presidential election convention of the PDP is a befitting end to the ambition of a greedy, untrustworthy and double-dealing politician. “With a miserly 317 votes, behind Aminu Tambuwal’s 693 votes and Atiku Abubakar’s 1532 votes, the PDP delegates have given clear indication that they are fed up with Saraki’s political style. When a leader cannot be trusted, cannot be relied upon, and cannot keep agreements, the people take due cognisance and records of these actions and respond with their votes at the appropriate time. “How will someone who emerged senate president through conspiracy with members of the opposition Party and against the wishes and interests of his own party be trusted to be elected as the presidential candidate of a party? Even on his being elected to the position, did Saraki acquit himself creditably? “Throughout Saraki’s tenure as senate president, it has been one confrontation between the national assembly leadership with the executive or another. “Confirmation of executive nominees sent to the senate has been delayed unnecessarily, annual national budgets delayed. For instance, the supplementary budget of the Independent National Electoral Commission (INEC) for the 2019 general election is continually delayed due to Saraki’s selfish political machinations. Nabena said Saraki could not continue to preside over the senate which is dominated by the APC. “Having sabotaged the President Muhammadu Buhari government while in the APC, he later showed his true colours by formally joining the opposition PDP,” the statement read.